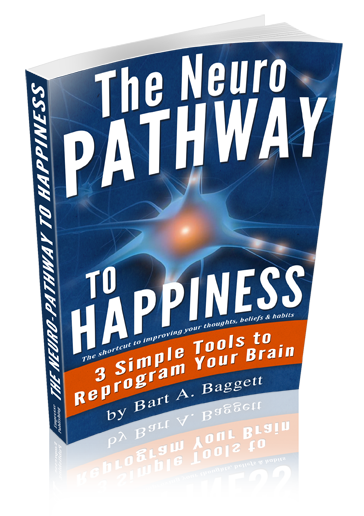 Welcome to the website for The Neuropathway to Happiness, the book and TEDx lecture by author and speaker Bart Baggett. The Neuropathway to Happiness explains 3 simple tools that you can use to reprogram your brain for optimal happiness. The process involved will literally re-wire and re-program your synaptic and neural pathways so that your brain physically transforms to becomes happier. Because so many people’s brains are hard-wired with bad habits, this reprogramming of your neuropathways is necessary for true and sustained happiness. This is the shortcut to improving your thoughts, beliefs, and habits. The book is scheduled for release Summer 2016. To watch or listen to Bart Baggett’s TEDx lecture on the Neuropathway to Happiness click here. Or click here to follow the event on Facebook.